Your patio door is a portal to your backyard and beyond. A quality patio door is more than just an aesthetic statement. It is also a source of energy savings and provides added security. Our carefully chosen suppliers offer a wide assortment of patio door systems in every kind of material suitable for residential or commercial use. 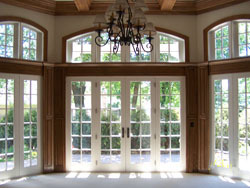 Since every patio door project has its own unique combination of style, security, and energy needs, we have to make sure we are working with the right suppliers to guarantee we will have the door that meets all of your project specifications.